For the plane, see Dominaria (plane). Dominaria is the first set to follow the Three-and-One Model, which abolished blocks. Richard Garfield is on the design team, for the first time since the original Innistrad set. It contains 269 cards (20 basic lands, 101 commons, 80 uncommons, 53 rares, 15 mythic rares), and includes randomly inserted premium versions of all cards. Ten additional cards are found in the set's planeswalker decks (2 mythic planeswalkers, 2 rares, 2 uncommons, 2 commons, and 2 common dual lands). These are numbered #270/269 to #279/269. A unique Buy-a-Box promotional card numbered #280/269 is also considered to be part of the set. Nostalgia and legendary creatures are major themes. Each booster contains at least one legendary creature, though this does not apply to the 8-card booster packs on MTG Arena. The expansion symbol depicts a Benalish shield. Because of its similarity to the Darksteel symbol, the common version has an inverted color scheme (more white than black). As a gimmick, all the names of sets taking place on Dominaria (including Alpha, Beta, Revised, Unlimited and Origins) or Rath (which was overlaid with Dominaria) are mentioned in card names or flavor text. Five of the basic lands feature a tiny silhouette of the Skyship Weatherlight in their art. Starting with Dominaria, Wizards of the Coast applies a new coating method for cards in English booster packs. A substantial part of the set was accidentally spoiled six weeks before release, when Wizards of the Coast China published the release notes for Dominaria, instead of those for Masters 25. Dominaria is set on the plane of the same name, for the first time since the Time Spiral block (or Magic Origins if sets involving multiple planes are included). Sixty years after the Mending, this world is healing from its wounds. 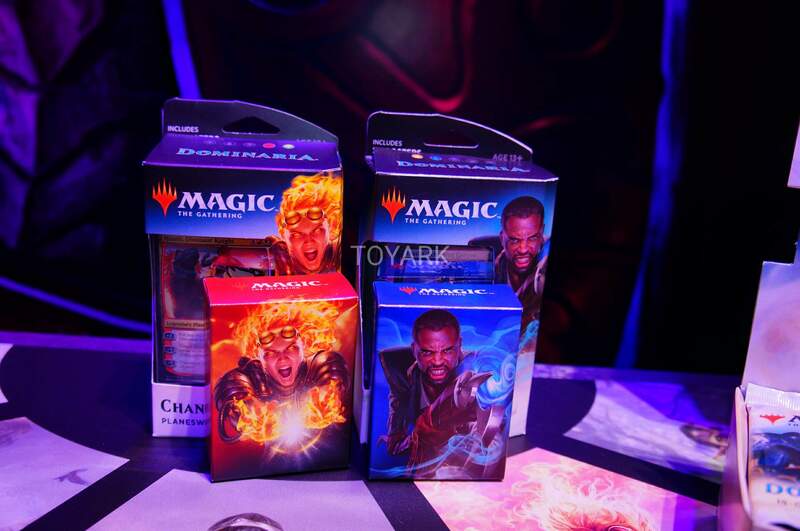 Returning legendary characters are Teferi, Jhoira, Jaya Ballard, and Karn. Dominaria’s story starts right after the events of Hour of Devastation. Gideon and Liliana have arrived on Dominaria following the Gatewatch’s defeat at the hands of Nicol Bolas. Together, they begin a mission to kill Belzenlok, the final demon holding Liliana’s contract. The cards that represent the Story Spotlights in Dominaria are: Broken Bond; Final Parting; Settle the Score and In Bolas's Clutches. The "Planeswalker redirection rule" is removed. Instead each relevant card will tell you on the card specifically whether the card dealing direct damage can target planeswalkers. Some older cards will be erratad to have “player” changed to “player or planeswalker”. Others will refer to "any target". As of Dominaria, the use of the term "mana pool" has been discontinued in the card text. Abilities which pertain to mana production will simply refer to the mana type being produced. As of Dominaria, Magic uses "they" as the preferred third-person-singular pronoun for a player, replacing "he or she", "him or her" or "his or her.". Abilities that modify how a spell behaves on the stack, such as additional costs, now refer to themselves as "this spell" rather than by using their card name. 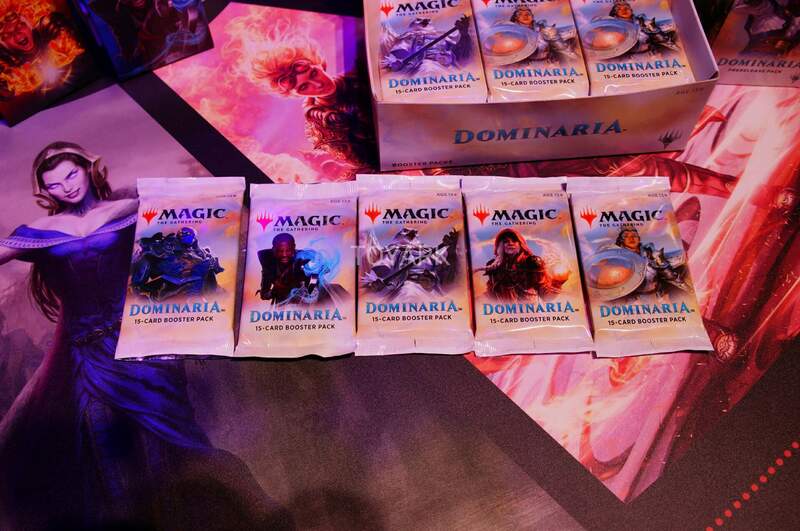 Dominaria is sold in 16-card boosters (one card being a marketing card), two planeswalker decks and the Dominaria bundle. The boosters feature artwork from Karn, Scion of Urza, Teshar, Ancestor’s Apostle, Jaya Ballard, Shalai, Voice of Plenty, and a artwork of Teferi not used by any card (which also was used in the package in Teferi's planeswalker deck). With the release of Dominaria, Wizards of the Coast began testing a new product at 300 Walmart locations across North America called the “Dominaria Theme Booster”. These contain 35 cards (a variable amount of commons and uncommons, and 1 rare or mythic rare) from a given color or theme. The MSRP is $6.99. By limiting this test to a single large account, WotC hoped to perform a controlled test that allowed them to more efficiently and accurately interpret sales results that would help inform future decisions about this kind of product. Color boosters may contain artifacts, as well. As a test, players in New Zealand were able to get MTG Arena codes inside select Dominaria booster packs, providing Closed Beta access as well as in-game items. In addition, players also get a randomized date-stamped foil legendary card (except On Serra's Wings and In Bolas's Clutches). Standard Showdown: foil basic land from Dominaria (no promo). As this promo was the only way to obtain this particular card, its release was heavily criticized. A comparison was made with the exclusive release of Nalathni Dragon in 1994, after which Wizards of the Coast had vouched to make all cards available one way or another for the main public. Dominaria features fourteen tokens and two emblems. 2/2 Knight creature with vigilance, for Aryel, Knight of Windgrace, Call the Cavalry and History of Benalia. */* Nightmare Horror creature, for Chainer's Torment. 3/1 Elemental creature with trample and haste, for Valduk, Keeper of the Flame. 1/1 Goblin creature, for Siege-Gang Commander. 4/4 Legendary Dragon creature with flying named Karox Bladewing, for Verix Bladewing. 1/1 Saproling creature, for Deathbloom Thallid, Fungal Infection, Fungal Plots, Saproling Migration, Spore Swarm, Verdant Force, Slimefoot, the Stowaway and Yavimaya Sapherd. 0/0 Construct artifact creature with "This creature gets +1/+1 for each artifact you control," for Karn, Scion of Urza. Verix Bladewing features a new template for creating tokens with names. "Create Karox Bladewing, a legendary 4/4 red Dragon creature token with flying" is functionally identical to the text "create a legendary 4/4 red Dragon creature token with flying named Karox Bladewing." History is the major theme for Dominaria, examplified by a significant number of legendary creatures and other legendary permanents. There is also a tribal theme for the Wizard class, with several cards costing less when you control a Wizard. A minor Knight tribal theme was taken from the never completed second Dominaria set, codenamed Salad. The set debuts legendary sorcery cards that capture extraordinary moments from main characters' pasts. These powerful spells can only be cast while you control a legendary creature or planeswalker. The set sees the return of kicker, a keyword ability that allows the player to pay an extra cost for a bonus effect. Kicker was first featured in the Invasion block and last seen in the Zendikar block. Crew is used for the Weatherlight Vehicle. Dominaria introduces "Hexproof from [quality]" as a variant of the hexproof ability. "Hexproof from black" means "this permanent can't be the target of black spells your opponents control or abilities of black sources your opponents control." It also introduces "equip [quality] creature" as a variant on equip. For example, "equip legendary creature" means "this equip activated ability can only target a legendary creature." Double is a keyword action formally introduced for Grunn, the Lonely King. The set introduces a new enchantment subtype: Saga. Each Saga tells the story of a key event from the past as it unfolds during each of the player's turns. As the Saga enters the battlefield and after the player's draw step, that player adds a lore counter, which triggers the appropriate chapter ability. Once all abilities have been triggered (for Sagas introduced in Dominaria, each has exactly three), the Saga is then sacrificed. Saga cards have a special vertically-aligned frame treatment. The rules text with the three chapter abilities is on the left side, and the art is on the right side. Historic is a new game term that refers to a card that has the legendary supertype, the artifact card type, or the Saga enchantment type. Some abilities trigger "whenever you cast a historic spell." Jaya is the newest planeswalker subtype. Returning creature types, typical for Dominaria, are Homarids, Kavu, Thrulls and sapient Apes. Starting with this set, all legendary cards except planeswalkers have a slightly different card frame with crown-like flourishes on the title bar. Reviving a practice used for the Portal sets, a thin separator bar now appears between rules text and flavor text on cards with both to make each more distinct. Starting with this set, FNM promos feature a dark text box with a planeswalker symbol watermark. The collector number lines up with its place in the main set, where it's also being printed. Dominaria has six mirrored pairs. Journeymages: A pair of 3/2 Wizard creatures with an enters the battlefield triggered ability — Academy Journeymage ( ) and Ghitu Journeymage ( ). Knights: A pair of Knights with a mana cost of M , power/toughness of 2/2, first strike and hexproof from the other's color. — Knight of Grace ( ) and Knight of Malice ( ). Naban's Iterations: A pair of Instants that are cheaper to cast if you control a Wizard. In that case, they are functionally identical to classic spells — Wizard's Retort ( ; Counterspell) and Wizard's Lightning ( ; Lightning Bolt). Kicked-Wizards: A pair of Human Wizards with a mana cost of M, power/toughness of 1/3, and a kicker cost of M — Caligo Skin-Witch ( ) and Ghitu Chronicler ( ). Off-color legends: A pair of legendary creatures with activated ablities that are off-color, going in opposite directions on the color wheel — Kazarov, Sengir Pureblood ( ) and Shalai, Voice of Plenty ( ). Legendary Auras: A pair of legendary Aura spells that make the enchanted creature also legendary, and have names that mirror each other — On Serra's Wings ( ) and In Bolas's Clutches ( ). Aesthir Glider, first printed in Alliances, last seen in Anthologies. Divination, first printed in Magic 2010, last seen in Conspiracy: Take the Crown. Fire Elemental, first printed in Alpha, last seen in Magic 2013. Gaea's Blessing, first printed in Weatherlight, last seen in Duel Decks: Nissa vs. Ob Nixilis. Gilded Lotus, first printed in Mirrodin, last seen in From the Vault: Twenty. Gideon’s Reproach, first printed in Battle for Zendikar. Goblin Warchief, first printed in Scourge, last seen in Duel Decks: Speed vs. Cunning. Icy Manipulator, first printed in Alpha, last seen in Duel Decks: Ajani vs. Nicol Bolas. Juggernaut, first printed in Alpha, last seen in Eternal Masters. Llanowar Elves, first printed in Alpha, last seen in Eternal Masters. Nature's Spiral, first printed in Magic 2010, last seen in Magic 2011. Opt, first printed in Invasion, last seen in Ixalan. Rescue, first printed in Urza's Destiny. Serra Angel, first printed in Alpha, last seen in Iconic Masters. Siege-Gang Commander, first printed in Scourge, last seen in Eternal Masters. Skirk Prospector, first printed in Onslaught, last seen in Vintage Masters. Tragic Poet, first printed in Urza's Legacy. Verdant Force, first printed in Tempest, last seen in Commander 2015. The enemy check lands, first printed in Innistrad. Two allied colored dual taplands, first printed in Oath of the Gatewatch, last seen in Amonkhet. Sage of Lat-Nam, first printed in Antiquities, last seen in Eighth Edition. Skizzik, first printed in Invasion. Thorn Elemental, first printed in Urza's Destiny, last seen in Eighth Edition. Syncopate, first printed in Odyssey, last seen in Return to Ravnica. Aven Sentry is a functional reprint of Assault Griffin from Magic 2011, except for creature types. Blink of an Eye is a functional reprint of Into the Roil from Zendikar. Cabal Evangel is a functional reprint of Walking Corpse from Innistrad and of Gutter Skulk from Gatecrash, except for creature types. Cold-Water Snapper is a functional reprint of Benthic Giant from Theros, except for creature types. Frenzied Rage is a functional reprint of Giant Spectacle from Kaladesh. Knight of New Benalia is a functional reprint of Blade of the Sixth Pride from Future Sight, Dromoka Warrior from Dragons of Tarkir, Oreskos Swiftclaw from Journey into Nyx, Devilthorn Fox from Shadows over Innistrad, and Raptor Companion from Ixalan, except for creature types. Mesa Unicorn is a functional reprint of Bishop's Soldier from Ixalan, except for creature types. Short Sword is a functional reprint of Leonin Scimitar from Mirrodin and Honed Khopesh from Amonkhet. Tolarian Scholar is a functional reprint of Blind Phantasm from Future Sight and of Jwari Scuttler from Rise of the Eldrazi, except for creature types. Jhoira, Weatherlight Captain is a blue-red creature that cares about artifacts, fulfilling a popular request by Commander players. Lich's Mastery is an alternate loss card. Weatherlight is one of the few cards having the same name as an expansion. Now a vehicle, each individual crew member can crew it on their own, except for its stowaway, who can do this with a Saproling token. Many cards reference past cards and places from past blocks set on Dominaria. ↑ Dave Humpherys (April 3, 2018). "Designing Dominaria's History". magicthegathering.com. Wizards of the Coast. ↑ Wizards of the Coast (June 14, 2017). "25th Anniversery Announcement Day". magicthegathering.com. Wizards of the Coast. ↑ a b c Mark Rosewater (Mark Rosewater). "Returning Home". magicthegathering.com. Wizards of the Coast. ↑ Mark Rosewater (April 22, 2018). ""The legendary creature appears in the slot of its rarity. If you get a rare legendary creature, that’s your rare for the pack."". Blogatog. Tumblr. ↑ Mark Rosewater (April 22, 2018). "What's throwing people off about the "Legend slot"". Blogatog. Tumblr. ↑ Mark Rosewater (April 20, 2018). "What does the Dominaria expansion symbol represent?". Blogatog. Tumblr. ↑ Mark Rosewater (March 23, 2018). "What's the reason for the common set symbol color change in Dominaria?". Blogatog. Tumblr. ↑ Mark Rosewater (March 30, 2018). "Wish commons would keep a black set symbol!". Blogatog. Tumblr. ↑ Mark Rosewater (April 22, 2018). "So, why was the common symbol colour changed?". Blogatog. Tumblr. ↑ Mark Rosewater (May 14, 2018). "Odss & Ends: Dominaria". magicthegathering.com. Wizards of the Coast. ↑ Blake Rasmussen (March 8, 2018). "Dominaria Leak". magicthegathering.com. Wizards of the Coast. ↑ a b c d e f Aaron Forsythe (March 21, 2018). "Dominaria Frame, Template and Rules Changes". magicthegathering.com. Wizards of the Coast. ↑ Gavin Verhey (April 16, 2018). "Dominiaria Prerelease Primer". magicthegathering.com. Wizards of the Coast. ↑ Blake Rasmussen (February 5, 2018). "Friday Night Magic Nontoken Promo Cards Return With Dominaria". magicthegathering.com. Wizards of the Coast. ↑ Blake Rasmussen (April 12, 2018). "The Tokens of Dominaria". magicthegathering.com. Wizards of the Coast. ↑ Mark Rosewater (March 13, 2018). ""If your theme isn't at common, it isn't your theme"?". Blogatog. Tumblr. ↑ Mark Rosewater (April 16, 2018). "Stories from Dominaria, Part 1". magicthegathering.com. Wizards of the Coast. ↑ a b c d e Matt Tabak (March 21, 2018). "Dominaria mechanics". magicthegathering.com. Wizards of the Coast. ↑ Marshall Sutcliffe (April 24, 2018). "A Whirlwind Tour of the Archetypes of Dominaria". magicthegathering.com. Wizards of the Coast. ↑ Mark Rosewater (May 7, 2018). "The Saga of Sagas". magicthegathering.com. Wizards of the Coast. ↑ Mark Rosewater (April 9, 2018). "A Historic Story". magicthegathering.com. Wizards of the Coast. ↑ a b Marshall Sutcliffe (April 24, 2018). "A Whirlwind Tour of the Archetypes of Dominaria". magicthegathering.com. Wizards of the Coast. ↑ Melissa DeTora (April 6, 2018). "A Look Into STandard Mana Bases". magicthegathering.com. Wizards of the Coast. ↑ Mark Rosewater (April 23, 2018). "Stories from Dominaria, Part 2". magicthegathering.com. Wizards of the Coast.